As auspicious dates go, 22 February, is mine. The international date line stole that day eight years ago as I shifted my life from the UK to New Zealand. Three years ago, the Christchurch earthquake shook up my foundations again on 22 February. Without recognition of the date, it seems that 22 February has worked in mysterious ways again. After months and months of deep thinking, otherwise known as procrastination, looking forward had finally paid off. Ideas that have bubbled away finally broke through the surface and I put a label on the outside of my notebook as a formal declaration of intention to myself that this project of day dreams and midnight insomnia is going to come alive for real. Now the hard part is over I can get on am make things happen. I read somewhere that should “create what you crave”. I have been pretty lucky doing that in life, career and business and for the first time this year I feel the backyard pantry to kitchen lifestyle is coming together. Meals come from what’s fresh in the garden. Admittedly I top up with bought vegetables and fruit because I’m not that good a gardener to have the perfect succession of food and when the crops go crazy you can get sick of eating the same thing day after day. Mostly I grow more food than two people and a couple of basset hounds can consume so our neighbours benefit from our bountiful existence. It seems to me there is no better feeling than knowing that with a lot of help from nature you’ve created something useful and delicious to eat. And, that good feeling keeps coming with every meal and every bite. When you eat things seasonally they become all the more luxurious making everyday meals a special occasion. You take more care to put your precious harvest to good use and be as creative in the kitchen. The first year I grew broad beans I had two sackfuls to harvest in one go. We froze most of the crop it just wasn’t the same to eat broad beans in winter. Beans are for spring. A verdant declaration that the best days of the year are to return out of the depths of winter. The sign of moving from warm comfort to refreshing invigoration. Heavy meals to light snacks and spontaneous grazing in the garden. 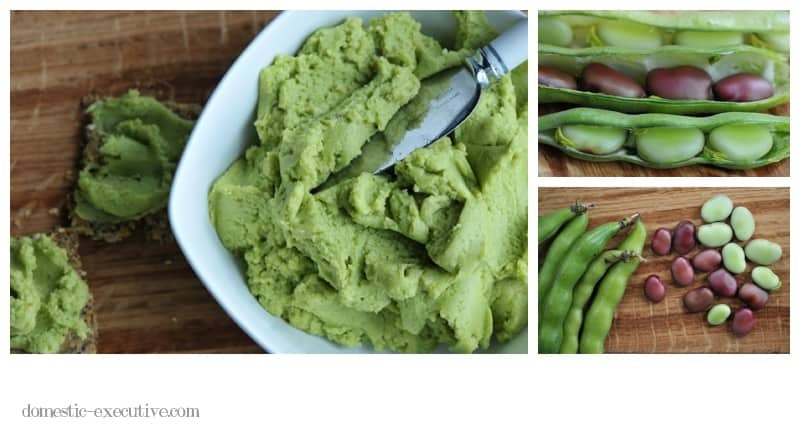 This year we ate broad beans in so many ways. On crackers, on toast, in risotto, with bacon, with blue cheese, on their own with garlic, butter and a spritz of lemon. I even hankered momentarily for a thick piece of gammon ham and a creamy parsley sauce I remember from my school days. But mostly I ate lots of raw beans freshly unzipped from their pods sitting on the grass with the bassets fighting me for the first bean that popped out. Broad beans are one of the most ancient foods. Protein dense, prolific and highly prized as a good luck charm. They also have magical properties in the garden returning nitrogen to the soil making them one of the most good-natured and tolerant vegetables around. I shall be able to see whether they continue to give pleasure through the year as I converted two kilos of broad beans into falafel and stacked them in the freezer. They are nestling up with the frozen cherries and strawberries destined for ice creams, jams and juices. Credit where credit is due. 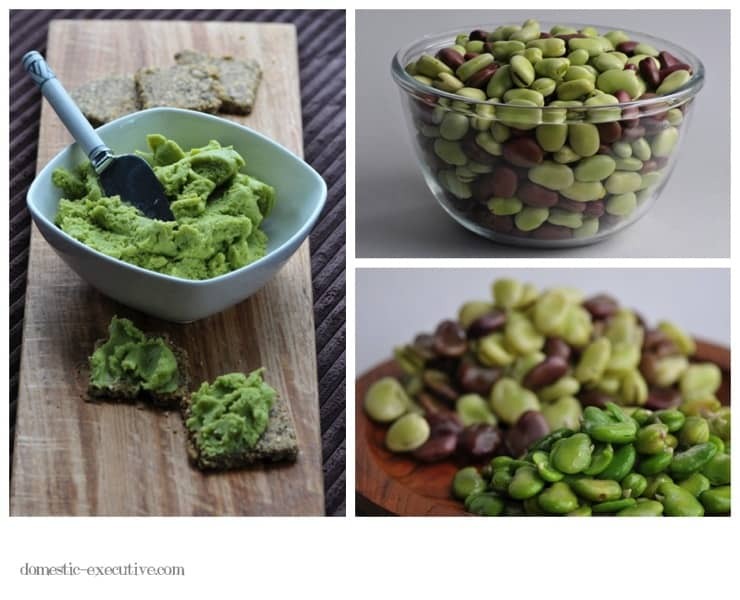 My fellow gardener cook blogging friend Sue was the inspiration for this bean pâté. I shall report on the success of the falafel next spring when I expect my food blogging to be a little more in forward-looking and in season. Lovely post and photos, and than you so much for the link. I appreciate it. I’m looking out the back at quickly ripening tomatoes, blueberries and strawberries. There’s a handful or two of peaches, plums and blackberries along the front path… and a glut of crab apples and Chilean guavas in the making. Such an inspiring time of year in the garden, and I love how blogging lets us all share each other’s garden lore.